Isaiah prophesied from 739–681 BC to a nation that had turned a deaf ear to the Lord. Instead of serving Him with humility and offering love to their neighbours, the nation of Judah offered meaningless sacrifices in God's temple at Jerusalem and committed injustices throughout the nation. The people of Judah turned their backs on God and alienated themselves from Him, which created the need for Isaiah's pronouncements of judgment—declarations made in the hope that God's chosen people would return to Him. Isaiah's overall theme receives its clearest statement in chapter 12: “Behold, God is my salvation, / I will trust and not be afraid” (Isaiah 12:2). This echoes the meaning of Isaiah's name, which means the “salvation of Yahweh.”2 Having read the book, one might wonder about the strong presence of judgment that runs through the first 39 chapters when the theme is salvation. How can the two co-exist? The presence of judgment indicates its necessity for salvation to occur. Before we can have salvation, we must have a need for it! In addition to its Gospel message, the book of Isaiah clearly articulates the sins of God's people—dealing with others unjustly which resulted in their offering hypocritical sacrifices to God. Do you see anything in your own life that might fall under Isaiah's critique of injustice—treating family, colleagues, or even strangers with unkindness or even disdain? Isaiah's message is also a call for believers to come back to purity in our love for God and for our neighbours (Luke 10:26–28). 1. Justin Martyr, Dialogue with Trypho, 120.5, trans. Thomas B. Falls, ed. Michael Slusser (Washington DC: Catholic University of America Press, 2003), 181. 2. Francis Brown, S. R. Driver, and Charles A. Briggs, The Brown-Driver-Briggs Hebrew and English Lexicon (Peabody, Mass. : Hendrickson, 2006), 447. 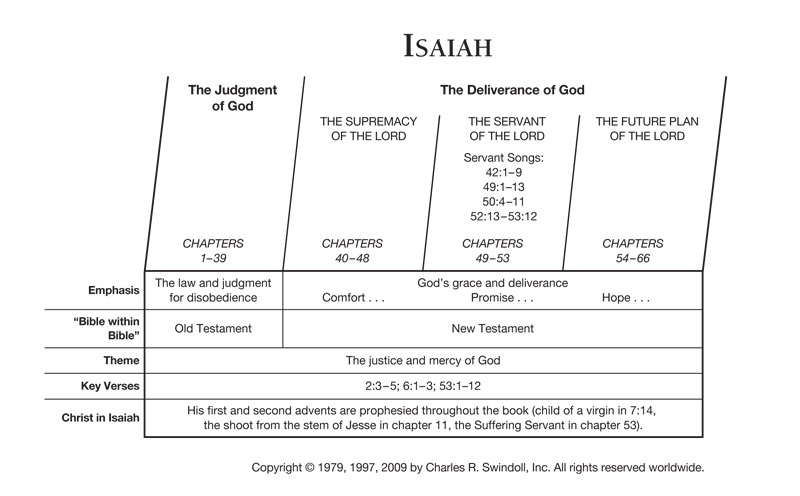 Find resources in the book of Isaiah in our resource library.